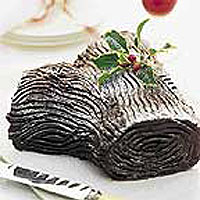 This decadent yule log makes a fabulous centrepiece for festive gatherings. The sponge is made by whisking the eggs and sugar to a thick foam before folding in the flour and cocoa. This ensures a light airy cake to offset the richness of the chocolate and chestnut filling and creamy chocolate icing. Preheat the oven to 190°C, gas mark 5. Grease a 26cm x 35cm shallow Swiss roll tin or baking tray and line the base and sides with baking parchment. To make the sponge, place the eggs and sugar in a large bowl and whisk with an electric whisk for 6-8 minutes until the mixture is pale and thick enough to leave a trail on the surface when the whisk beaters are lifted. Tip the flour and cocoa into a sieve and sift over the whisked mixture. Fold in using a large metal spoon, cutting through the mixture until all traces of flour are gone. Fold in 2 tablespoons of hot water, then drizzle with the melted butter and blend in, using the same method as for the flour. Pour the mixture into the tin, spreading evenly into the corners. Bake for 15-20 minutes until the cake is firm to the touch. Turn out onto a clean sheet of baking parchment, peel off the baking parchment and roll up the sponge, starting from the short end, to enclose the paper. Leave to cool. For the filling, beat the chestnut purée in a medium bowl until softened. Break up the chocolate and melt in a small bowl placed over a pan of simmering water. Stir into the chestnut purée, then add the vanilla extract, sifted icing sugar and milk and mix well. Leave to cool. Gently unroll the cake, then spread the filling evenly over the top, leaving a 1cm border around the edge. Carefully re-roll the cake, using the paper to help you, then place on a board and cover with clingfilm while you make the icing. Pour the cream into a small pan and bring gently to the boil. Remove from the heat, add the chocolate and stir until melted and smooth. Beat in the icing sugar until smooth. Leave to cool, then chill in the fridge for at least 1 hour until the mixture reaches a spreadable consistency. Cut a small diagonal slice from one end of the cake and spread a little icing over the straight end. Attach to one side of the larger cake. Place on a flat serving plate or cake board. Spread the remaining icing evenly over the cake until completely covered. Using a fork, mark 'bark' patterns in the icing. Dust lightly with icing sugar and chill in the fridge until the icing has set, about 30 minutes. For best results use a good-quality plain chocolate with approximately 72% cocoa solids, such as Waitrose Continental Plain Chocolate or Green & Black's Organic Cooking Chocolate. Take the eggs out of the fridge an hour before using as they whisk to a greater volume at room temperature. Don't be tempted to rush the whisking process as the cake will collapse in the oven if the mixture is too thin. The chocolate can be melted in the microwave in paragraph 4 of the instructions. Break into squares and place in a heatproof bowl. Heat on medium for 1 minute, then stir gently and heat for a further 30-60 seconds until melted. The yule log will keep well for up to 3 days in the fridge, loosely covered with foil. It can also be frozen for up to 1 month. Open freeze until firm, then wrap in foil or place in an airtight container. Allow to defrost overnight in the fridge. Swiss roll tins vary in size. If you use a slightly smaller tin at 24cm x 34cm it will take 15 to 20 minutes longer to cook. Holly and berries are poisonous to eat. If you use them as a decoration, wrap the stalk in foil before placing it in the log.